Cute Hello Kitty Passport Cover! 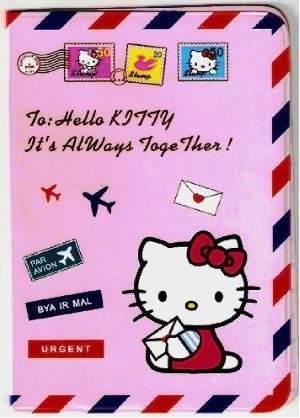 Saw this on Amazon yesterday, what a cute Hello Kitty passport cover X). It’s done in the style of an air mail letter which is of course pink and has little Hello Kitty stamps on it. Hello Kitty is pictured on the front holding a letter, is she about to send the letter off or open and read it…who knows but it’s cute. The reviews for this Hello Kitty passport cover are mixed, some people absolutely love it and others think that the plastic is too cheap. I guess if it didn’t work out you could always keep it around as a really cute decoration lol.